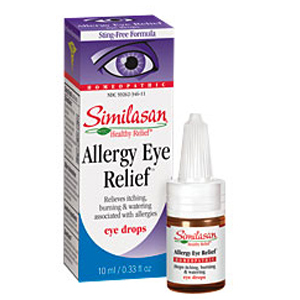 Eye Doctor recommended Similasan Eye Drops for Allergy Eye Relief stimulate the eye’s natural ability to fight symptoms of allergies due to pollen, pet dander, mold spores and more. 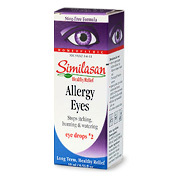 Similasan Eye Drops provide Heathy Relief with no known side effects or drug interactions. For adults and children age 2 and over: Remove tamper-evident seal from neck of bottle. Twist cap off bottle. Squeeze plastic tip to release 2-3 drops into eye. Apply as needed. Replace cap after use. Warnings: For external use only. Initial exacerbation of symptoms may occur. Use only if bottle seal is intact. Replace cap tightly after every use. To avoid contamination, do not touch the tip of the container to any surface. Discard open bottle after 30 days. Contact wearers: consult a physician prior to using. Do not use: If the solution changes color or becomes cloudy. If pregnant; consult a doctor. Stop use and ask a doctor if: Symptoms worsen or persist for more than 72 hours. Changes in vision occur. You experience eye pain. Active Ingredients: Apis 6X, Euphrasia 6X, Sabadilla 6X. Inactive Ingredient: Borate buffer, Sodium nitrate, Silver sulfate (as preservative), purified water. Similasan products stimulate the body to heal itself by utilizing "microdilutions" of the active ingredients. This system of medicine is know as homeopathy. In the production of Similasan homeopathic medicines, all active ingredients (originating from mineral, plant or animal) undergo the process of serial dilution. The result is a microdiluted concentration of the ingredient, and its dilution level is often represented by an "X." For example, an ingredient diluted to the level of 6X contains 0.0000001% of the active ingredient—just enough to jump start the immune system. This homeopathic mode of action is similar in theory to a conventional allergy or flu shot, yet the active ingredients in homeopathic products are much more dilute, and are therefore safe for all ages without known side effects. You may ask why the ingredients, such as apis (honey bee), belladonna and mercurius are used as active ingredients? After all, those substances can trigger various symptoms when used in heavy concentrations. This is true. In homeopathy, however, the dosages are not concentrated enough to poison the body. In fact, the dosage level is only enough to cause the body to detect the presence of the ingredient and then react to it. The body then reacts by triggering the immune system to heal the underlying problem. For example, a microdilution of honey bee will trigger the body to fight symptoms such as burning, stinging and swelling. In many cases, the cause of such symptoms is an allergy, therefore the ingredient apis (honey bee) is used to treat allergies. In summary, homeopathy is a completely unique way of treating ailments. Rather than imposing a chemical drug on the body with the hope of temporarily masking symptoms, homeopathic active ingredients attempt to stimulate a physiological reaction of the body's healing mechanisms. In other words, homeopathy encourages the body to maintain proper health by imposing a gentle stimulus. What ingredients are used in Similasan products? Homeopathic medicines contain ingredients that originate in the form of minerals, animals and organically grown plants. These ingredients are serially diluted according to homeopathic principles. The final result is a non-toxic, homeopathic medicine. Why are Similasan products unique? Similasan products are non-toxic and free of harsh chemicals. They do not cause the rebound effect, nor do they have any known side effects or known drug interactions. All Similasan products are strong enough for adults, yet gentle enough for children when used as directed. What are the side effects of Similasan products? Similasan products cause no known side effects. Can I use Similasan Cataract Care after cataract surgery? This product is not contra-indicated for use after surgery, however you should always check with your doctor before taking any medication after a major medical procedure. Can I use Similasan Eye Drops with my contact lenses? While Similasan Eye Drops work wonderfully for relieving irritation from contact lenses, we cannot advertise them as contact lens solutions,because that particular use of Similasan Eye Drops has not yet been evaluated by the FDA. To use the drops, we strongly recommend that you first remove your lenses. Can I use these products while pregnant/nursing? As with all OTC products, if you are pregnant or nursing you should check with your doctor before using the product. If possible, check with an MD who is familiar with homeopathic products. Can I use Similasan Cataract Care if I think I have cataracts but have not yet been diagnosed by a doctor? If you suspect that you have cataracts you should see your eye doctor immediately. Similasan Cataract Care should not be used as a substitute for professional medical attention. Are Similasan products safe for pets? Because Similasan products have not been evaluated or approved as a veterinary medicine, we recommend that you talk to your vet before using the product on a pet. The word homeopathy is derived from the Greek words: homoios (similar) and pathos (suffering). Using the Law of Similars, the objective of Homeopathy is to release and reinforce the immune mechanisms of the human body and to stimulate the healing process. Subtle stimulations, using diluted substances are what achieve this goal. How do Similasan products work? My doctor isn't familiar with Similasan products or how they work. Where can I find a doctor who is? We recommend visiting an MD who has received training in homeopathy. The National Center for Homeopathy publishes a list of homeopathic practitioners on its website. Are Similasan products regulated by the U.S. Food and Drug Administration? Yes. All Similasan products are manufactured in accordance with FDA guidelines for homeopathic remedies. Those guidelines are outlined in FDA's Compliance Policy Guidelines for the labeling, marketing and selling of homeopathic drugs in the United States. What kinds of quality control measures does Similasan take? Similasan pays very meticulous attention to quality control. Our Swiss manufacturing facility is certified according to Good Manufacturing Practice (GMP) guidelines. Water used in the production of the products is filtered, and double distilled. Sterile, tamper-proof, glass bottles are used for Similasan products because glass is the best material to ensure the continued quality of the product. Products are stored out of the direct sunlight to prevent decreasing potency over time. Does Similasan perform animal testing? No. Similasan products are never tested on animals. Will Similasan products cause dependence or "the rebound effect?" While conventional OTC medicines (i.e. antihistamines, lubricants and vaso- constrictors) clear up, or "mask," the symptoms temporarily, those same symptoms often come back with shorter periods of relief in between applications. For this reason, many people develop a dependency on OTC eye drops and nasal sprays. On the contrary, Similasan Active Response Formulas address the immune system, thus stimulating the body to heal on its own. There is no worry of toxic build-up or the rebound effect with any Similasan product. How often can I use Similasan Active Response Formulas? Similasan products can be used as often as needed. Let your symptoms be the guide and use the product when symptoms reappear. In the case of earache, we strongly urge consumers to see a physician immediately if the pain persists beyond 48 hours. This could signify an ear infection that may require antibiotics. You may continue the use of Earache Relief ear drops for pain while taking antibiotics. When using Similasan Cataract Care we recommend dosing 4-5 times daily, however this product can also be used as often as needed. Will Similasan products interact with my other medications? No. Similasan products will not interfere with any other OTC or prescription medication you may be taking. In fact, we recommend the use of Similasan products in conjunction with other medications. For example, if you are taking a drug that causes dry eyes, Similasan is a great treatment for dry eye that will not interact with your prescription. Similasan Earache Relief ear drops are also safe to use with antibiotics if necessary. How fast will Similasan Active Response Formulas work? This varies with each individual and often depends on the duration of the condition. If the condition is acute, most people will see results immediately. At the onset of acute symptoms, we recommend using the medicine every 15 minutes until the symptoms subside. To relieve a chronic problem, the medicine will take anywhere from 2 to 10 days. In this case, one can use the medicine as often as possible. We recommend at least 3 times per day. With cataracts, if your symptoms are chronic and/or you've had diagnosed cataracts for more than one year, best results will be achieved if Similasan Cataract Care is used 4-5 times daily over a period of 1-3 months. How will Similasan Cataract Care help with "aging eyes" and can I use this product for symptoms such as blurry vision even if I don't have cataracts? The ingredients in Similasan Cataract Care have been shown to help with "aging eye" symptoms that are unrelated to cataracts. These symptoms include eye fatigue, blurred vision and excessive tearing. Similasan Cataract Care will provide relief for all symptoms listed on the packaging; however we strongly recommend consulting an eye care professional if you are experiencing any changes in vision. What if my condition appears to be getting worse? With homeopathic remedies, a temporary worsening of symptoms is rare, but can happen. This process is called an "initial exacerbation" or a "healing reaction" and is a good sign. It indicates that the right medicine has been used. It should last no more than 1-3 days. This occurs in only about 5% of people. Ordinarily, these healing reactions are very weak and disappear quickly. In the event of a such a reaction, interrupt treatment until the reaction disappears. If desired, we recommend re-introducing the product to your body under the supervision of a physician (MD) who is familiar with homeopathy and it's mode of action. Eye Drops #2 Allergy Eyes is shipped in a discrete, unmarked package. Orders are processed immediately and usually take about 3 to 5 working days to be received. We do ask that you try it for 2 to 3 weeks to feel the full effects. Any information received is used only for order processing and shipping purposes. Your information, such as e-mail address, will never be disclosed to a third party.